Shoulder arthritis is a common condition which can lead to pain and lost function in one’s shoulder. The simple definition of arthritis is inflammation of the joint. The shoulder is made up of three bones (scapula, humerus, and clavicle) and contains two joints (glenohumeral and acromioclavicular). The glenohumeral joint is the ball and socket joint which provides most of your motion. It is the joint most commonly being referred to when someone is diagnosed with shoulder arthritis. There are five main types of arthritis which can affect the glenohumeral joint. Osteoarthritis is the “wear and tear” kind of arthritis which people are most familiar with. While it occurs in weight bearing joints like the hip and knee more often, primary osteoarthritis can cause joint degeneration, loss of cartilage, and rubbing of bone on bone in the shoulder as well. Rheumatoid Arthritis and other types of related inflammatory arthritis will lead to destruction of the soft tissues around the shoulder as well as the joint surfaces. Post traumatic arthritis is similar to osteoarthritis but occurs because of a prior dislocation or fracture of the shoulder. Avascular Necrosis (loss of blood supply) of the humeral head is also a potential cause of shoulder joint degeneration. Rotator Cuff Tear Arthropathy is a distinct pattern of joint destruction which happens when patient’s have a massive unrepaired rotator cuff tear. Pain: In general, arthritis of the shoulder will cause pain which is felt deep down inside the shoulder joint. It can radiate to any of the areas surrounding the joint as well. It is typically described as a dull “toothache” type of pain with occasional sharp jabs of pain with motion. It is common to have symptom levels go up and down over time. The pain usually gets worse with increasing activity and can make it very difficult to find a comfortable sleeping position. Stiffness: As it does in any joint, arthritis in the shoulder leads to stiffness and lost range of motion over time. Because of the body’s ability to compensate, many people are functionally unaffected by this lost range of motion or don’t notice it until it is quite severe. It is common to have more stiffness in the morning which loosens up throughout the day. The initial treatment for shoulder arthritis is modification of activities, anti-inflammatory medications (NSAIDS), and cortisone injections. Physical therapy does not tend to help very much and might increase your pain due to increased use. Medications such as fish oil or Glucosamine/Chondroitin may potentially benefit a patient as well. In the case of rheumatoid arthritis, there may be other special medications which your rheumatologist may recommend to help control your disease and its progression. Arthroscopic Surgery: In more mild cases of shoulder arthritis, arthroscopic surgery may be a possibility. During this procedure, small incisions are used to insert a camera and instruments into the shoulder. The surgeon can debride (remove) damaged cartilage and clean out the shoulder joint. They may also address other pathology in your shoulder which can be leading to pain such as bursitis or biceps tendon degeneration. This is done under general anesthesia as an outpatient and usually takes 1-3 months to recover from. The outcome is less predictable because the surgeon is not getting rid of your arthritic joint and you symptoms may return. Total Shoulder Replacement: Like many joints in the body, an arthritic shoulder can be treated with a joint replacement in order to decrease pain and potentially increase function. In the shoulder, a new head made of metal and a new cup made of plastic comprise the new shoulder joint. The operation requires a larger “open” incision in the front of your shoulder and is done under general anesthesia. An overnight stay in the hospital or surgical center is needed for pain control and intravenous antibiotics. It takes about 4-6 months to fully recover from surgery. Because of the potential for the metal and plastic components to loosen, patients are limted to 20-25 pounds of lifting with that arm for life and are encouraged to avoid “violent” or “jarring” activities such as splitting firewood. Shoulder Hemiarthroplasty: A hemiarthroplasty is an operation that is very similar to a total shoulder replacement. However, in a hemiarthroplasty, the cup side of the joint is not replaced. Recovery is very similar and allows return to full use between 4-6 months postoperatively. The risk of loosening of components is much less, so no restrictions on use are given once the patient has recovered. 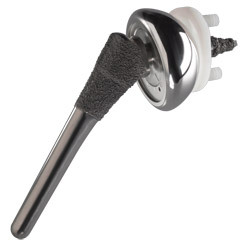 The drawback of a hemiarthroplasty is that pain relief is not as reliable since the arthritic cup is still present. The arthritis can progress and necessitate a revision to a total shoulder replacement later on in life if a hemiarthroplasty is chosen as the initial procedure. If you have shoulder arthritis and are looking for some relief, call Dr. Scott Murch today at 715-847-2382 to be scheduled for an appointment.